The Silver Cloud Hotel Seattle Stadium is located next to Safeco Field - home of the Mariners. Century Link field home of the Seahawls and Sounders and the WAMU Theatre. 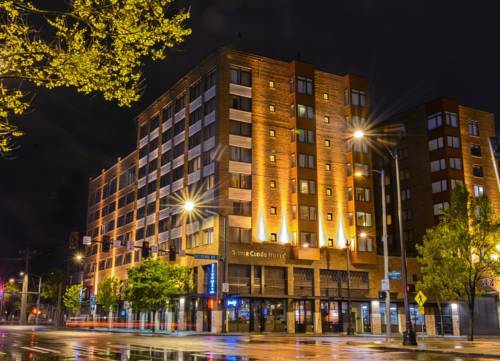 Within walking distance to the historic Pioneer Square District the hotel has easy access to I-5 and I90 and is the closest downtown Seattle hotel to Sea-Tac International Airport. The hotel features rooms with comfortable King besds or two Queen beds/King Suites and Jacuzzin King Suites. All rooms have 55 in. Plasma HD TVs and I-pod docking station alarm clock radios as well as refrigerators and microwaves. For the business traveller the hotel offers FREE wired and wireless high speed internet access/FREE local calls/24 hour FREE business center withan ATM. For leisure travelers the Silver Cloud Hotel Seattle Stadium is located in the heart of the Seattle sports scene. The hotel features a heated roof top pool and hot tub open all year round. The onsite restaurant and bar Jimmys On First offers breakfast/lunch/dinner and room service and features Pacific Northwest dining in a casual atmosphere with all the games on a 50in. Plasma HD TV. For those guests driving secured onsite valet parking is available as well as our Free local area shuttle to Seattle businesses and famous downtown attractions. The Silver Cloud Stadium has over 3400 sq ft of versatile banquet and meeting space on the top floor overlooking downtown Seattle and Elliott Bay. Located across the street from Safeco Field and Seahawk Stadium. This upscale yet casual bar and grill is located on the corner of Royal Brougham and Occidental nestled right in between CenturyLink Field and Safeco Field. "Waiting for the Interurban" is a statue of commuters that encourages art attacks by creative vandals. "Landing Zone" sculpture by artist Peter Reiquam keeps park goers and encounter seekers dry beneath its 9-ft. tall telescoped legs. Collection of autos, amassed by a former garbageman, includes the Flintstonemobile from the 1994 movie. Coffee shop in a narrow alley between two buildings. Take out only.